What does a hunk of wood have to do with an elegant French patisserie? 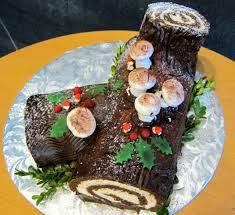 It’s the notorious Buche de Noel, inspired by the ancient Yule Log tradition. The traditional burning of a Yule Log – simply a chunk of a which had been treated with aromatics like pine cones or sometimes even wine or salt – at the winter solstice goes back to the Middle Ages. 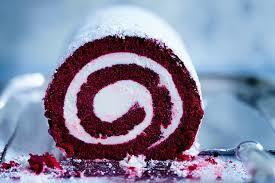 At some point, (between the 17th and 19th centuries, depending on who you believe) a creative cook started decorating her cake rolls to look like the logs, and the tradition spread. 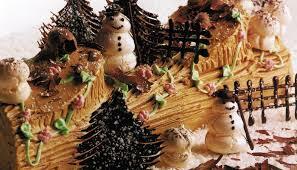 Like the Christmas tree, the Buche de Noel has nothing to do with the religious holiday for which it is named other than being an accoutrement to the festive winter celebrations. A Buche de Noel is basically a rolled sponge cake, really a glorified Drake’s Yodel, which often looks a lot better than it tastes, so very important to make a flavorful sponge cake, delicious filling and icing, and decorations that actually taste like something. It can be very elaborate, including branches, or can be simple but delicious. 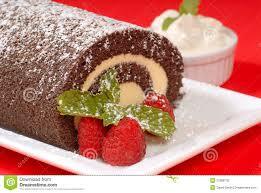 If you can make a cake roll, you can make a Buche de Noel. Ambitious cooks can create marshmallow “mushrooms”, make piped frosting flowers and other fancy garnishes, all great if you have the interest/time/skill. But, you can also decorate simply, e.g. with beautiful red raspberries or nuts. 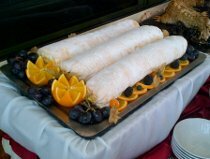 A relative, with no historical connection but also a special occasion dessert, is the Philippine Brazo de Mercedes, a rolled cake confection that is wildly popular, and even shows up on cruise ships whose staff enjoy this as a taste of home. So, don’t wait 12 months until next Christmas to have some fun!